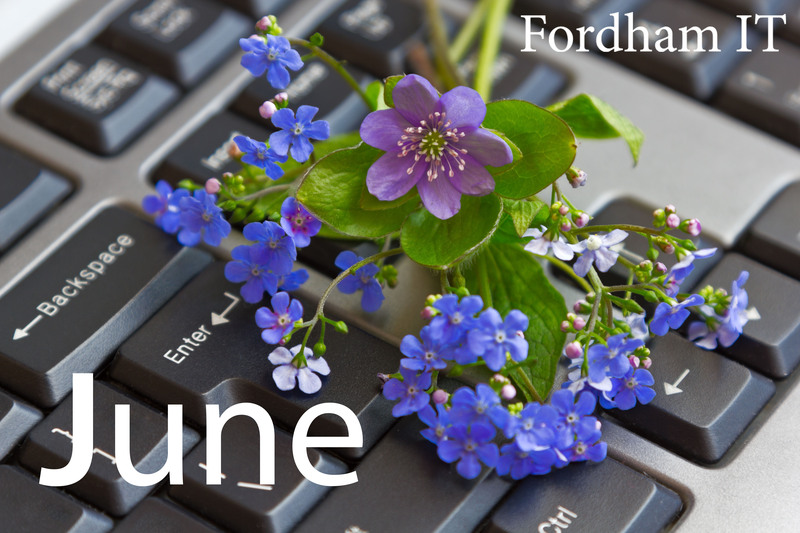 Events and maintenance also appear on the IT calendar, located at the bottom of our website landing page, and on our Twitter feed (@FordhamIT — and you don’t need a Twitter account to see our tweets). Many of us at Fordham handle sensitive data associated with students and employees. Fordham’s policies and other regulations, such as FERPA and HIPAA, govern how to share and store that data. To navigate those requirements and the many acronyms associated with them, please consult the new Data Classification Grid. By the way, Fordham University’s Data Classification Policy applies to all data produced, collected, stored and/or used by the University, its employees, student workers, consultants and agents during their relationship with the University. If you have questions about data classification at Fordham, contact IT Customer Care or send a message to IT Security: infosec@fordham.edu. Many wonderful Google apps are linked to your Fordham Gmail address. These apps are grouped into two categories: Core Apps and Non-Core Apps. A terms of service agreement needs to be signed for each app category before you can use them for the first time. Google Core Apps include Gmail, Drive, Calendar, Sites, Groups, and Hangouts. Connect to these apps by clicking on the small, grey grid icon in the upper right-hand corner of your Fordham Gmail page. Read more about them here and find the link for the terms of service, which is an agreement between you and Fordham University to use Sites and Groups. Google Non-Core Apps include YouTube, Photos, and Blogger. Connect to these apps by clicking on the small, grey grid icon in the upper right-hand corner of your Fordham Gmail page. Read more about them here and find the link for the terms of service, which is an agreement between you and Google. Submit your request for the software you’d like installed in the computer labs or smart classrooms for the fall 2016 semester today! Call IT Customer Care at 718-817-3999 or use their online request service, via the Tech Help tab (search for “software,” “smart classroom,” or “computer lab”). Requests may be made for new applications, upgrades, special set ups, reconfigurations and/or additions to existing software. Proof of legal purchase and adequate licenses, or copies of the software, are required. An ITAC representative will contact you to work on the request. Implementation of the Virtual Desktop Infrastructure (VDI) is currently underway throughout the University. When the lease on your Windows-based, University-owned computer expires, it may be replaced with a computer (called a thin client) that supports VDI. VDI expands your access to your desktop and files by giving you 24-hour remote access to them from almost any device, including tablets, laptops, and traditional desktops. In addition, your data is more secure. Read more. We are nearing the end of testing and updating Fordham’s systems to make sure they are compatible with Microsoft and Apple’s OS upgrades. We expect to give the green light for upgrading El Capitan on June 20 and Windows 10 on July 15. Stay tuned!